The race starts and finishes at the outskirts of the village of Strathyre beside the A84 at the South entrance to the village. (grid ref. 561167) The route follows a track uphill behind the start area & joins the forest road after about 500 yards in a South direction. After about 2 miles the edge of the forest is reached (grid ref 577145). Turn left in a N.E. direction – rough ground – no path – follow edge of forest to (grid ref 583160) cross Meal Mor (550m) to point (grid ref 585160) overlooking Glen Ample. Down the hill to cross the hill-walkers’ path through Glen Ample (350m) grid ref 591160). The climb up a steep heather slope to the top of Beinn Each (grid ref 603158) is a bit more testing until you reach the summit at 811 metres. From Beinn Each the route follows a hill walkers path along an undulating ridge to Bealach nan Caber (grid ref 603165) (Cross-over Point) then follows the same path for a scramble to Stuc a’ Chroin (972m)(grid ref 617175) via Bealach Glas (grid ref 606171). The Return: An ascent to Bealach nan Cabar (Cross-over Point), down long grass slopes to cross Glen Ample path (grid ref 591158) then follow the forest track to the welcoming crowds to return to Strathyre. It is often included in the British Fell Running Championship and is classed as a long race. It is very hard beginning as it does with the short, steep climb up from the start at Strathyre to the forestry road which takes you up almost to the drop into the glen. The wee bit over tussocky grass before you can see over the edge is also pretty steep before the different challenge altogether of the drop down. As a walker I used to hate the rocky scramble up to the to and hated the coming back down even more. 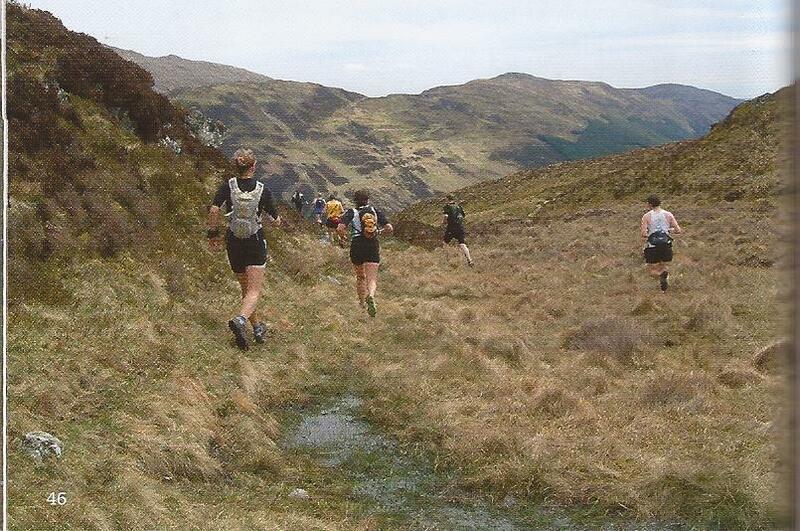 A well supported race, there are usually a lot of English athletes taking part because of the nature of the event – and possibly as a recce for the following years. The campsite south of the village is usually jam packed as are the local B&B’s and hotels – this year (2014) will be more difficult because two of the hotels, the Munro and the Ben Sheann, are closed which means two restaurants and bars fewer as well. Two sets of toilets fewer too! It is also well supported by the locals who turn out to welcome the athletes home at the end. It’s a great day, a wonderful event and deservedly popular with all connected with it. This is maybe more remarkable because it is one of very few hill races throughout the British Isles which is not organised by a running club or combination of clubs. Organised entirely by local volunteers it is a model for all other races.